The Norwegian Embassy in South Africa, together with the Department of Science and Technology (DST), has signed a declaration of intent to develop a new bilateral research programme focused on the oceans economy. The intent for the development of the programme, called the South Africa-Norway Oceans (Sanocean) programme, was signed by Norwegian Ambassador to South Africa, Botswana, Madagascar and Namibia Trine Skymoen and DST International Cooperation and Resources deputy-director-general Daan du Toit at the second Norway-South Africa Science Week, which took place in Pretoria on Thursday. Speaking to Engineering News Online on the sidelines of the event, Skymoen said that Sanocean was the fourth bilateral research programme between South Africa and Norway. “It follows the collaborative South Africa–Norway Cooperation (Sancoop) programme, which has been jointly operated by the National Research Foundation (NRF) and the Research Council of Norway and has funded 19 bilateral research projects since 2013,” said Skymoen. 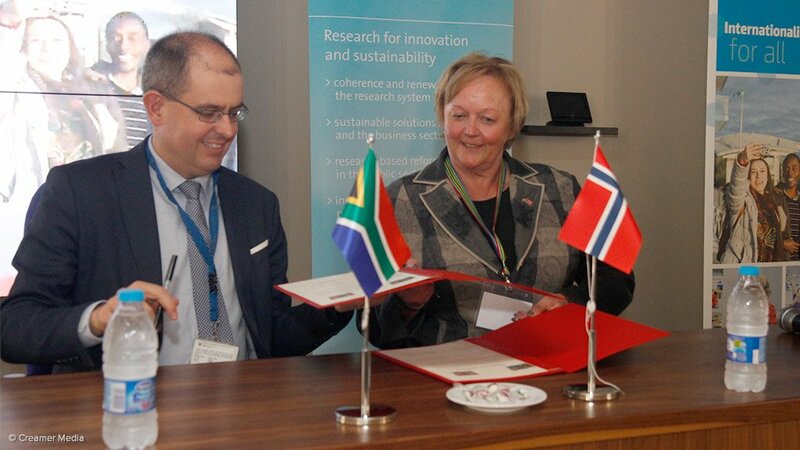 She added that Sancoop, which focuses on clean energy, the environment and climate change, has been a successful cornerstone of Norwegian–South African research relations. Sanocean, meanwhile, will have an increased emphasis on the oceans economy, which focuses on sustainable development in the areas of oceans and ocean space in South Africa and Norway. It also dovetails with South Africa’s Operation Phakisa Oceans Economy programme, which brings together representatives from government, industry, labour, civil society and academia to collaborate in unlocking the economic potential of the country’s oceans. Operation Phakisa was launched in 2014 and is designed to find faster ways of implementing the National Development Plan priorities in various sectors, such as South Africa’s blue economy, which encompasses the oceans economy. In 2010, the ocean contributed about R54-billion to South Africa’s gross domestic product (GDP) and accounted for about 316 000 jobs. The country’s oceans also have the potential to contribute up to R177-billion to the GDP, as well as the potential to contribute between 800 and a million direct jobs. These growth levers reflect at least 4% yearly growth in both GDP contribution and job creation. “Sanoceans will help transfer competence and knowledge bilaterally,” noted Skymoen. She further highlighted the importance of focusing on the health of the oceans and to harvest ocean resources sustainably. Skymoen added that, to deal with challenges and opportunities in the oceans economy space, there was a need for more knowledge and more sharing of experience and expertise. “We must learn more about coastal area ecosystems and the effects of human activity on marine life,” she said. Skymoen highlighted that the Sanocean programme offered the potential to build both countries’ knowledge and skills base, which was needed to put oceans back on track ecologically. “This shift towards the blue economy is important for both our countries,” she said. The Sanocean programme is expected to run from 2018 to 2023 with the financial support of the DST and will be implemented jointly by the NRF in South Africa and the Research Council of Norway.